A classic that's been updated to deliver modern day performance. All hail Henry! Having been around since the 80s, Henry certainly knows a thing or two about vacuuming. The Henry HVR200 is one of the newest versions of Numatic’s iconic red vacuum cleaner, yet he still retains the same doe eyes and nostalgic smile he’s had for decades. Robust yet compact, the technology behind the machine continues to make him a top-notch solution for vacuuming around the home, as well as in larger settings too. What’s more, he has an A-rating for energy efficiency. 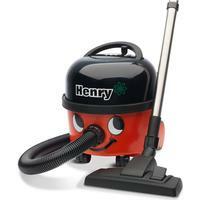 Whilst Henry looks the same as ever, he’s more effective at tackling dust and dirt than ever before. Fitted with a high efficiency long-life 620w motor, the HVR200 provides 1200w of suction power that’s effective on any surface, whether you’re taking on carpets, rugs, or hard floors. Dirt is taken through the machine’s TriTex filtration system before being collected in a HepaFlo bag, which sits within a 9 litre capacity bin. When you eventually need to change the bag, it takes just a matter of seconds to remove and replace it with a new one. Manoeuvring the Henry HVR200 while vacuuming is also pretty effortless. Weighing 8.1 kg and measuring 36 x 34 x 37 cm, it’s pretty compact for an upright vacuum cleaner, allowing you to move through your home while it glides behind you, letting you focus on the task at hand. An icon of 80s housework, the great thing about the Henry HVR200 is that it isn’t brimming with unnecessary futuristic extras - it’s just a simple, faff-free vacuum cleaner that does a good job. That’s not to say it doesn’t have any useful features however, because it certainly does. The wand docking station is one of these, and allows you to stow everything away neatly when you’re done vacuuming. Another useful addition is the HVR200’s 10-metre power cable, which comes in very handy if you’re cleaning larger spaces, or happen to live in a particularly grand home. The cable boasts a reliable rewind system too, allowing you to wrap up the job in a matter of seconds. Numatic produces a variety of attachments for their vacuum cleaners, with a tool and extension for just about any nook and cranny. When you buy the Henry HVR200 you’ll find an arsenal of add-ons in the box, which include stainless steel extension tubes, a crevice tool, a soft dusting tool, and an upholstery nozzle as well. Why you should buy it: A cheap reliable vacuum, with a bit of personality about it (which most others can't say). You've probably got to know a few of these at school or work, but for not much money you can also have one for your home.